Most malaria vectors belong to species complexes. Sibling species often exhibit divergent behaviors dictating the measures that can be deployed effectively in their control. Despite the importance of the Anopheles funestus complex in malaria transmission in sub-Saharan Africa, sibling species have rarely been identified in the past and their vectoring potential remains understudied. We analyzed 1149 wild-caught An. funestus (senso lato) specimens from 21 sites in Kenya, covering the major malaria endemic areas including western, central and coastal areas. Indoor and outdoor collection tools were used targeting host-seeking and resting mosquitoes. The identity of sibling species, infection with malaria Plasmodium parasites, and the host blood meal sources of engorged specimens were analyzed using PCR-based and sequencing methods. 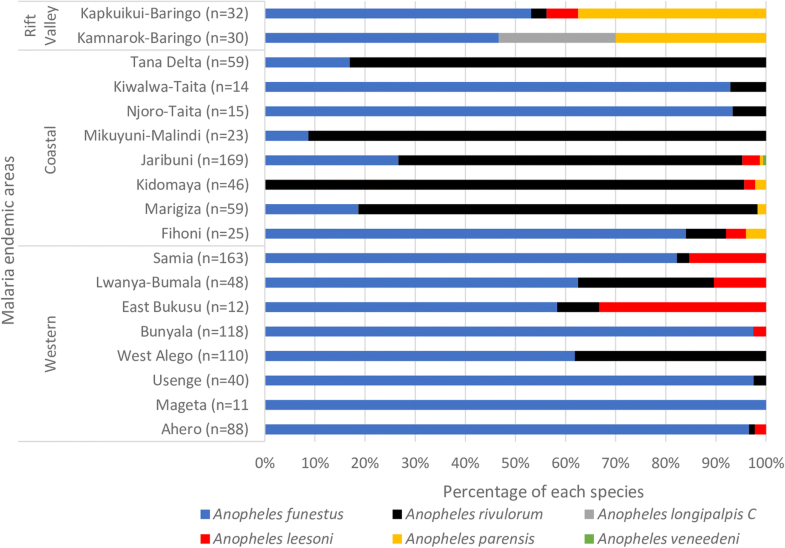 The most abundant sibling species collected in all study sites were Anopheles funestus (59.8%) and Anopheles rivulorum (32.4%) among the 1062 successfully amplified specimens of the An. funestus complex. Proportionally, An. funestus dominated in indoor collections whilst An. rivulorum dominated in outdoor collections. Other species identified were Anopheles leesoni (4.6%), Anopheles parensis (2.4%), Anopheles vaneedeni (0.1%) and for the first time in Kenya, Anopheles longipalpis C (0.7%). Anopheles funestus had an overall Plasmodium infection rate of 9.7% (62/636), predominantly Plasmodium falciparum (59), with two infected with Plasmodium ovale and one with Plasmodium malariae. There was no difference in the infection rate between indoor and outdoor collections. Out of 344 An. rivulorum, only one carried P. falciparum. We also detected P. falciparum infection in two non-blood-fed An. longipalpis C (2/7) which is the first record for this species in Kenya. The mean human blood indices for An. funestus and An. 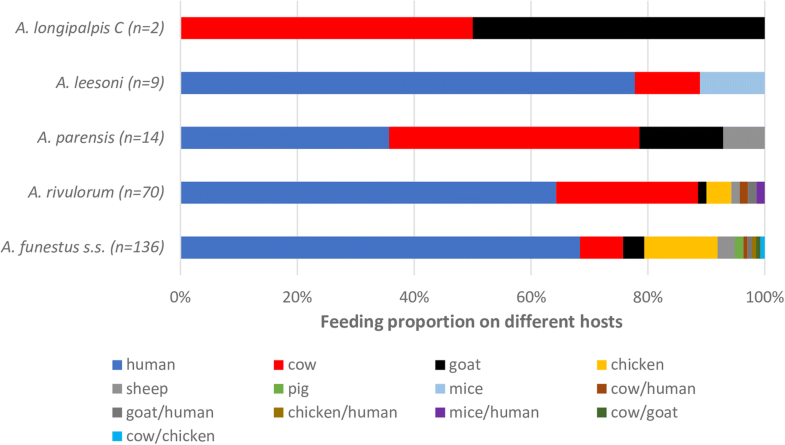 rivulorum were 68% (93/136) and 64% (45/70), respectively, with feeding tendencies on a broad host range including humans and domestic animals such as cow, goat, sheep, chicken and pig. Our findings underscore the importance of active surveillance through application of molecular approaches to unravel novel parasite-vector associations possibly contributed by cryptic species with important implications for effective malaria control and elimination. Malaria remains the most important vector-borne disease in tropical countries of the world, especially in sub-Saharan Africa (SSA). The scale-up of long lasting insecticidal net (LLIN) distribution has contributed to a decline in malaria transmission, number of cases and mortality within the last decade , prompting efforts toward a target of 2030 for elimination. Sustained malaria reduction has proved challenging in many disease-endemic countries of Africa. Whilst in many settings LLIN coverage is high, malaria transmission persists  and there is need for a better understanding of the vector species composition. Surveillance of vector populations becomes increasingly important to inform fine-tuning of control strategies in the event of changing local conditions  or to discern cryptic species contributing to stealth transmission. The major African malaria vectors belong to two species complexes: Anopheles gambiae and Anopheles funestus [4, 5]. Few studies in Kenya have examined the contribution of Anopheles funestus sibling species to malaria transmission, despite its well-established role in malaria transmission . It is well known that An. funestus (sensu stricto) (hereafter referred to as An. funestus) is the primary vector species in the An. funestus group . Recent reports of novel Plasmodium falciparum sporozoite associations in An. vaneedeni , as well as yet-to-be-identified species [8, 9], suggest the possibility of adaptive changes in vector systems among the group. This underscores the importance of active surveillance of vector populations for potential emerging threats as malaria is being controlled. Bionomic traits and susceptibility to Plasmodium infection vary among the 13 sibling species known to occur throughout the Afrotropical region in the An. funestus group: An. funestus, An. funestus-like, An. aruni, An. confusus, An. parensis, An. vaneedeni, An. longipalpis types A and C, An. leesoni, An. rivulorum, An. rivulorum-like, An. brucei and An. fuscivenosus . Five species have been documented to occur in Kenya, namely An. funestus, An. rivulorum, An. leesoni, An. parensis and An. vaneedeni [6, 10]. Of these, P. falciparum infection has been found in An. funestus as the main vector [11, 12] and to a minor extent in An. rivulorum [13, 14] and An. leesoni . The often small sample sizes of An. funestus (s.l.) mosquitoes analyzed by molecular means in most of these studies preclude a detailed understanding of the occurrence and ecological distribution of member species in this complex and corollary, their vectoring potential of malaria parasites. This study focused on the An. funestus group in relation to possible ongoing variations in vector-parasite associations in Kenya. Specifically, we examined the identity and occurrence in the An. funestus group sibling species, Plasmodium infection rates and blood-feeding patterns from specimens sampled from varied malaria-endemic locations in coastal, western and Rift Valley areas of Kenya. We analysed female specimens of the An. funestus complex collected from randomly selected consenting households in diverse sites in the different epidemiological risk zones for malaria in Kenya . 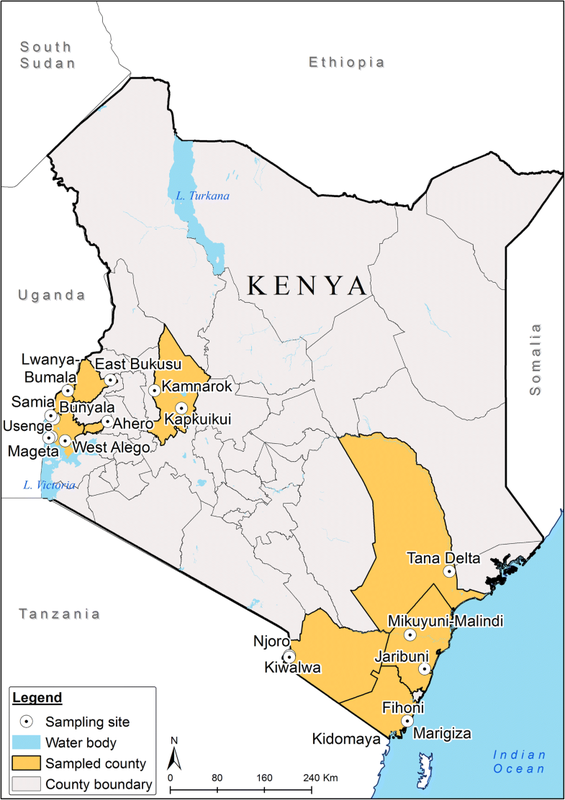 These included Kwale County (Kidomaya, Marigiza, Fihoni), Kilifi County (Jaribuni, Malindi), Taita-Taveta County (Kiwalwa, Njoro), Tana River County (Tana Delta) in the coastal region and Busia County (Bunyala, East Bukusu, Samia, Lwanya-Bumala), Kisumu County (Ahero) and Siaya County (Usenge, West Alego, Mageta) in the Lake Victoria basin in western Kenya and more seasonal malaria transmission areas including the arid and semi-arid areas of northern and central Kenya such as Baringo County (Kapkuikui, Kamnarok) (Fig. 1). Samples from the study sites were mainly collected in 2017, except for those from Ahero, Usenge and Kamnarok (2015), and Mageta (2014). Mosquito collections were undertaken both indoors and outdoors with CDC light traps targeting host-seeking mosquitoes for most sites (Bunyala, East Bukusu, Samia, Lwanya-Bumala, West Alego, Kidomaya, Marigiza, Fihoni, Jaribuni). This was achieved by deploying 10 traps per site (5 indoors and 5 outdoors) in separate randomly selected households. At the sites in Ahero, Tana Delta, Kapkuikui, collections were limited to outdoors only using CDC light traps (10) while in Kamnarok, Usenge, Mageta, Njoro and Kiwalwa, collections were limited to indoors using pyrethrum spray catches (PSC) or backpack aspiration (ASP) targeting resting mosquitoes. CDC light traps were set at 18:00 h and retrieved at 06:00 h the following day with PSC and ASP collections conducted between 06:00 and 08:00 h. Indoor and outdoor catches were not undertaken systematically to compare trapping efficiency indoors and outdoors at a particular site, but different tools and locations were used in an attempt to identify the mosquito species richness. We extracted genomic DNA from individual whole specimens using the Qiagen DNeasy Blood and Tissue Kit (Qiagen, Hilden, Germany) as per the manufacturer’s instructions. The DNA was used for identification of the sibling species as well as probing for Plasmodium infection and host blood meal sources. 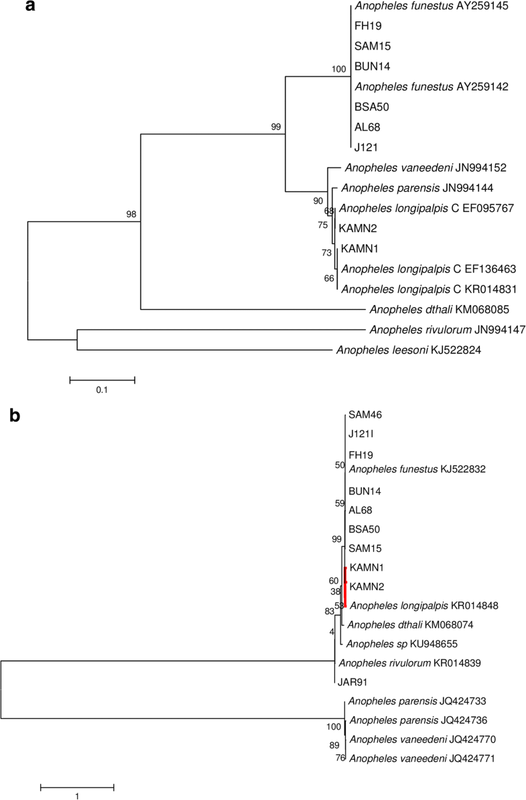 Molecular identification of member species of the An. funestus complex involved polymerase chain reaction (PCR) amplification of the polymorphic ITS2 region of ribosomal DNA using established primers [16, 17]. The PCR in a 15 μl reaction involved 0.5 μM each of the primers, 3 μl of 5× Hot Firepol Blend Master Mix Ready to Load (Solis BioDyne, Tartu, Estonia) and 2 μl of DNA template. PCR cycling conditions were as follows: initial denaturation at 95 °C for 15 min, followed by 30 cycles of denaturation at 95 °C for 30 s, annealing at 46 °C for 30 s and extension at 72°C for 40 s, and a final extension at 72 °C for 10 min. Thermal reactions were conducted on SimpliAmp Thermal Cycler (Applied Biosystems, Loughborough, UK). Size fragments characteristic of each species were distinguished after separation in agarose gel electrophoresis (1.5%) stained with ethidium bromide against a 100 bp DNA ladder (O’ Gene Ruler, Fermentas, Fisher Scientific, Loughborough, UK). We screened for Plasmodium infection in individual specimens by analyzing high resolution melting (HRM) profiles generated from real time-PCR (RT-PCR-HRM) products of non-coding mitochondrial sequence (ncMS) as described before  and/or amplification of the cytochrome c oxidase 1 (cox1) gene . Plasmodium falciparum DNA obtained from the National Institute for Biological Standards and Control (NIBSC; London, UK) was used as a standard reference positive control. RT-PCR-HRM was performed in RotorGene Q thermocycler (Qiagen) with RotorGene Q software v.2.1 (Qiagen) with Plasmodium infection determined by comparing melt curves to those obtained using a positive control. Conventional PCR for Plasmodium parasite detection targeting the cox1 gene was carried out in a 15 μl reaction containing 0.5 μM of each primer, 9 μl of PCR water, 3 μl of 5× Hot Firepol® Blend Master Mix (Solis BioDyne) and 2 μl of DNA template. Amplification was carried out with the following cycling parameters: 95 °C for 15 min, 40 cycles of 95 °C for 30 s, 59 °C for 30 s and 72 °C for 40 s, followed by 72 °C for 10 min. For further confirmation, the PCR product of all positive samples by RT-PCR-HRM and a subset of cox1 gene amplicons were purified using ExoSAP-IT (USB Corporation, Cleveland, OH, USA) and outsourced for sequencing (Macrogen, Seoul, Republic of Korea or University of Notre Dame, Notre Dame, Indiana, USA). Sequences were viewed and edited in Chromas, embedded in MEGA v.6 software  prior to querying GenBank using BLAST. Multiple sequence alignments of the resulting contiguous sequences were performed using ClustalW with default parameters. Maximum likelihood phylogeny was computed using the best fit model of sequence evolution with nodal support for the different groupings evaluated through 1000 bootstrap resampling. We further confirmed the species identity of Plasmodium-positive mosquito specimens by amplifying and sequencing of ribosomal DNA internal transcribed spacer region 2 (rDNA ITS2) gene  and/or the mitochondrial cytochrome c oxidase subunit 1 (cox1) gene . PCR volumes for rDNA ITS2 and cox1 were: 15 μl containing 0.5 μM final concentrations for each primer, 9 μl of PCR water, 3 μl of 5× Hot Firepol Blend Master Mix (Solis BioDyne) and 2 μl of DNA template. Amplification was undertaken with the following cycling parameters: initial denaturation at 95 °C for 15 min, followed by 40 cycles of denaturation at 95 °C for 30 s, 30 s annealing at 60 and 50 °C for rDNA ITS2 and cox1, respectively, and extension at 72 °C for 40 s, and a final extension at 72 °C for 10 min. Thermal reactions were conducted on SimpliAmp Thermal Cycler (Applied Biosystems). The samples were purified as previously described and outsourced for sequencing (DNA Sequencing Facility, University of Illinois at Urbana-Champaign, Champaign, IL, USA). Sequences were similarly cleaned and compared to GenBank database and consensus sequences aligned using ClustalW or MUSCLE in MEGA v.6 for cox1 and ITS, respectively. Maximum likelihood (ML) trees were constructed (1000 bootstraps) with inclusion of reference sequences as outgroups utilizing the GTR+G and Kimura-2 parameter model of sequence evolution for cox1 and ITS gene fragments, respectively, in MEGA v.6. To detect blood-meal host sources, cytochrome b (cyt b), 16S ribosomal rRNA and cytochrome c oxidase subunit 1 (cox1) fragments were amplified from genomic DNA extracted from engorged Anopheles mosquitoes using RT-PCR-HRM (Rotor Gene Q thermocycler; Qiagen) and compared to profiles of known positive controls as previously described . Extracted DNA from sugar-fed insectary-reared Anopheles mosquitoes served as negative controls. Known vertebrate DNA used in a previous study, namely cow, Swiss mouse, pig, goat, chicken and human, were included as standard reference positive controls. PCR volumes of 10 μl contained 0.5 μM concentrations of each primer, 6 μl of water, 2 μl of 5× Hot Firepol Evagreen HRM Mix (Solis BioDyne) and 1 μl of DNA template. Amplification for cyt b and 16S rRNA primers was carried out as previously described . High resolution melting profiles generated were analyzed using HRM analysis tools present in the RGQ software. Vertebrate hosts were determined through comparison of the Anopheles mosquitoes’ blood meal HRM melt profiles to those of the standard reference control species. We used Pearson’s Chi-square tests in R v.3.3.1  to evaluate the difference in proportions at an α = 0.05 level of significance. We established the Plasmodium infection rate (IR) as the percentage of the number positive out of the total number examined. Overall proportions of mosquitoes and IR were compared indoors and outdoors using Pearson’s Chi-square test. We analyzed 1149 specimens of which 87 (7.6%) did not amplify in PCR. Of the 1062 that successfully amplified, 627 specimens originated from indoor sampling and 435 from outdoor sampling. Anopheles funestus was predominant (59.9%) followed by An. rivulorum (32.4%), An. leesoni (4.6%), An. parensis (2.4%), An. longipalpis C (0.7%) and An. vaneedeni (0.1%). Species composition of the An. funestus complex, however, varied between sampling areas, with higher proportions of An. rivulorum collected in coastal sites (Fig. 1). Proportionally, An. funestus dominated indoor collections (476/627; 75.9%), while specimens of An. rivulorum dominated in the outdoor collections, mainly from the coastal area (253/435; 58.2%) (Fig. 2, Table 1). Overall, we observed a significantly higher proportion of An. funestus indoors than outdoors (476/636 vs 160/636; χ2 = 156.0, df = 1, P < 0.001), confirming its highly endophilic nature. Likewise, captures of An. leesoni were significantly more frequent indoors than outdoors (40/49 vs 9/49; χ2 = 18.4, df = 1, P < 0.001). In contrast, a much higher proportion of An. rivulorum was trapped outdoors than indoors (253/344 vs 91/344; χ2 = 75.4, df = 1, P < 0.001) (Table 1) suggesting an exophilic tendency for this species. Comparable numbers of An. parensis were encountered indoors (12/25) and outdoors (13/25) (Fig 2, Table 1). Sequencing of ncMS and/or cox1 gene amplicons indicated Plasmodium infections in 65 specimens, of which 62 shared 100% identity to Plasmodium falciparum [GenBank: CP017005 (ncMS); NC037526 (cox1)], two shared 100% identity to P. ovale [GenBank: AB354571 (ncMS); KP050417 (cox1)] and one shared 100% identity with Plasmodium malariae [MF693428, GQ355486 (cox1)]. These Plasmodium species identifications are supported by the sequence alignment (Additional file 1: Figure S1). Among cox1 gene (615–658 nt) and/or ITS2 rDNA (267–763 nt) PCR product sequences of specimens found positive for Plasmodium infection, 62 shared 100% identity with An. funestus [GenBank: KJ522832 (cox1); KJ522816 (ITS2)], one shared 100% identity with An. rivulorum [GenBank: KR014839 (cox1)] and two shared 100% identity with An. longipalpis C [GenBank: KR014831, EF095767 (ITS); KR014848 (cox1)]. The mosquito specimen identifications are further supported by ML phylogeny (Fig. 3a, b). Selected sequences of Plasmodium isolates detected by the cox1 gene (369–477 nt) were deposited in the GenBank database under the accession numbers (MH547428-MH547442 (P. falciparum), MH547443 (P. ovale wallickeri) and MH547444 (P. malariae). Furthermore, selected sequences of Plasmodium-positive specimens were deposited in GenBank [accession numbers: An. funestus MH299885-MH299890 (cox1), MH298707-MH298752 (ITS2); An. rivulorum MH547425 (cox1), An. longipalpis C MH547426-MH547427 (cox1), MH536653-MH536654 (ITS2)]. Fifty-nine, two, and one specimens found infected with P. falciparum, P. ovale and P. malariae, respectively, were associated with An. funestus. This translated to a Plasmodium infection rate (IR) of 9.7% (62/636). One P. falciprum infection was associated with An. rivulorum (IR = 0.3%, 1/344) and two with An. longipalpis C (IR = 28.6%, 2/7). The two Plasmodium infected An. longipalpis C were collected indoors (2/7) from Kamnarok (Baringo County), while the infective An. rivulorum was recorded outdoors (1/253) in Jaribuni from coastal Kenya. Plasmodium falciparum infections, especially in An. funestus, occurred in diverse sites: P. ovale from West Alego and Bunyala, Plasmodium malariae from Samia, western Kenya (Fig. 1). Site differences were observed with Plasmodium rates ranging from 3.5% in Bunyala to 50% in Lwanya-Bumala; however, these figures need to be interpreted with caution since sampling dates and seasons were variable, hence direct comparisons could not be made. Notably, Plasmodium infections were more frequently detected in the malaria endemic western Kenya sites than other sites (Table 1). We analyzed 231 engorged specimens for blood-host sources, comprising 48 collected indoors by PSC/aspiration and 183 outdoors using CDC-light trap. Overall, the human blood index for An. funestus was 68.4% (93/136) and 64.3% (45/70) for An. rivulorum. Human feeds were also encountered for An. leesoni and An. parensis. The two blood-fed An. longipalpis C specimens had each fed on cow and goat. Mixed feeding on humans and other animal hosts and was observed for An. funestus and An. rivulorum, both of which displayed a feeding tendency on a broad host range (Fig. 4). Most malaria endemic countries including Kenya have embraced the global plan to eliminate the disease through upscaling of vector control measures, particularly with LLINs . However, these measures have impacted vector behaviors, bionomics and vectorial systems [26, 27]. Our data indicate high Plasmodium infection rates in An. funestus, affirming its role as the main vector relative to the other sibling species in the group (reviewed in ). Furthermore, we provide the first report of An. longipalpis C for Kenya. This species, known for its zoophagic but endophilic tendencies has never been associated with Plasmodium transmission . However, we found two out of seven specimens P. falciparum-positive, indicating that feeding on humans had taken place. Although recorded in low numbers, its potential role as secondary vector in the more arid areas of Kenya should be further investigated. We uncovered a higher species richness among the An. funestus group than previously documented in Kenya. Furthermore, sympatric occurrence of more than three sibling species in a locality as observed in this study, highlights the importance of integrating molecular approaches in surveillance efforts for adequate assessment of the impact of interventions on vector populations . A lack of amplification of some specimens calls for further improvement of existing protocols to adequately discriminate and identify An. funestus group members. We found considerable site differences in Plasmodium infection rates in An. funestus ranging from 3.5% in Bunyala to 50% in Lwanya-Bumala (Table 1). However, these figures should be interpreted with caution since sampling dates and seasons were variable, hence direct comparisons could not be made. Notably, Plasmodium infections were more frequently detected in this species in the malaria endemic western Kenya sites compared to coastal sites. Such site-to-site variation in infection rates is well recognized and may result from differences among populations and their impact on malaria transmission in different ecologies. Differences have been observed at the genetic level between coastal and western populations of An. funestus  although whether this pattern potentially impacts differentially on transmission has not been assessed. Nonetheless, the high infection rates observed in western Kenya where malaria persists despite indoor vector control  warrants further research. Residual transmission has emerged as a major threat to effective malaria control, as key vectors alter their phenotypes to render current proven vector control interventions such as LLINs less effective. Examples include exhibition of behavioral plasticity in resting and feeding patterns. We found a rather low human blood index (64.8%) for An. funestus compared to the near exclusive human feeding habit previously noted for this species [6, 12, 31]. Although variation in this pattern by site or ecology cannot be discounted, the data indicates a certain degree of zoophily and an unusual behavioral divergence in its feeding habits supported by feeding on a broad host-range. Its outdoor behavior might reduce the impact of LLINs on the species and hence contribute to residual transmission. This assertion is supported by its growing prominence in malaria transmission in recent times in Kenya  following the dwindling importance of Anopheles gambiae (s.s.) at large in East Africa , which calls for further research into its adaptive biology and role in the disease persistence and even resurgence. Species records are based on sampling efforts, which in our study was limited in scope (i.e. intensity and duration of trapping in each location) and targeted the rainy seasons only. Seasonal occurrence including species succession has been shown to influence changes in sibling species composition . Studies over longer periods covering seasonal scales need to be encouraged to establish the full profile of sibling species in this group in the context of persistent malaria transmission in Kenya and elsewhere. Our findings underscore the need for improved surveillance of vector populations employing molecular techniques including sequencing to improve malaria vector control and working towards malaria elimination. This is essential for fine-tuning control strategies in the event of changing local conditions  and for discerning cryptic vectors that may contribute to stealth transmission. Our findings have revealed a higher species richness among the An. funestus group than previously documented in Kenya. Notably is the occurrence of An. longipalpis C and for the first time, naturally infected with Plasmodium falciparum. Anopheles funestus remains the main vector species in the Funestus group in Kenya which was found to exhibit a rather low human blood index. Our findings underscore the importance of active surveillance through application of molecular approaches to unravel novel parasite-vector associations possibly contributed by cryptic species with important implications for effective malaria control and elimination. We thank Dr Joseph Mwangangi and Ms Julia Wanjiru for contributing samples from Taita-Taveta and Ahero, and Jackson Kimani for design of the map used in this study. Special thanks to Nixon Onyimbo for support with field mosquito collection and for the community members in the villages who provided access to their homesteads. The study was funded by a grant from the Foundation for the National Institutes of Health through the Vector-Based Transmission of Control: Discovery Research (VCTR) programme of the Grand Challenges in Global Health Initiative. Additionally, we gratefully acknowledge the financial support for this research by the following organizations and agencies: UK Department for International Development (DFID), Swedish International Development Cooperation Agency (Sida), Swiss Agency for Development and Cooperation (SDC), and the Kenyan Government. The views expressed herein do not necessarily reflect the official opinion of the donors. The datasets supporting the conclusions of this article are included within the article and its additional file. The raw data can be obtained from the corresponding author upon reasonable request. Selected sequences of Plasmodium isolates detected by cox1 gene (369–477 nt) have been deposited in GenBank (accession numbers: P. falciparum, MH547428-MH547442; P. ovale wallickeri, MH547443; and P. malariae, MH547444). Furthermore, selected sequences of Plasmodium-positive specimens were deposited in GenBank [accession numbers: An. funestus, MH299885-MH299890 (cox1), MH298707-MH298752 (ITS2); An. rivulorum, MH547425 (cox1); An. longipalpis, C MH547426-MH547427 (cox1), MH536653-MH536654 (ITS2)]. UF, DKM, BT and DPT conceived the experiment(s). EOO, IMO and DPT conducted the experiment(s). EOO, JV and DPT analyzed the results. DPT wrote the draft manuscript. All authors read and approved the final manuscript. We acquired ethical approval for mosquito trapping from the Scientific and Ethical Review Unit (SERU) of the Kenya Medical Research Institute (Non-SSC Protocol #388 and Non-SSC Protocol #310). We sought informed consent to trap mosquitoes in and around homesteads from village elders and household heads.